Lonan Church Crosses, Isle Of Man. SC4273 7937. Lonan old church (Kirk Lonan or Keeil-ny-Traie) is located just 1 mile south of the A2 east-coast road at Ballakilley, 1 mile south of Baldrine and 1 mile east of Onchan. Douglas is 4 miles to the south. The church is partially ruined now but it is still a very interesting site with it’s ancient churchyard and nine Celtic-style crosses and slabs. The little church, dedicated to St Adamnan or Eunan, dates from the 12th-14th century but there was an earlier 7th century building on this site that stood on a pre-Christian, pagan site; it’s eastern wall is probably the earliest part of the church. St Adamnan, an irish monk, was abbot of Iona in western Scotland between 679-704 AD, though St Patrick’s nephew St Lonan was the first to settle here back in the late 5th century AD. He was apparently third bishop of Mann after St Maughold. St Lonan’s holy well (Chibbyr Onan) can be found just to the south of the church. Thanks to the Rev John Quine, a local antiquarian, the church was saved from complete destruction in 1895. The most spectacular of the nine crosses (no 73) is in it’s original position at the south side of the kirk-yard. 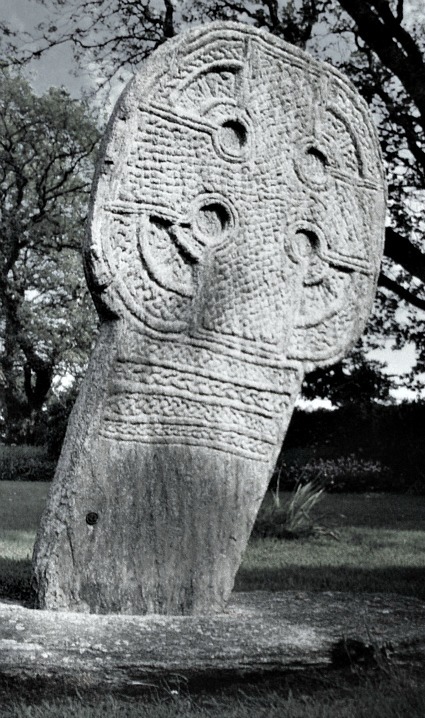 It stands at 8 feet high and has a large equal-limbed Celtic wheel-head cross that is almost completely covered in interlacing, knot-work and plait-work designs. This dates from the 5th century AD. All the other cross-slabs stand against the north wall in the roofed area at the east side of the church. The other eight cross-slabs and fragments, numbered 23, 27, 71, 75, 76, 77, 160 and 177, are heavily worn and only faint carvings can be seen; one has been repaired and shows part of a small wheel-cross, and there are two fragments of ‘The Glenroy Cross’. These show Celtic and Norse workmanship and are more recent in date, probably 8th to 10th century AD. You can see the casts of these cross-slabs at the Manx museum in Douglas. Categories: Ancient Crosses, Lonan Church Crosses | Tags: Ancient Crosses, Lonan Church Crosses in Isle of Man | Permalink.